The Sugar Event Calendar plugin comes with several different widgets that you can use for showing event-related information and tools. This widget is used for showing a calendar inside of a widget area. It show both large and small calendars, as well as calendars with all events, or only specified categories. The usage of this widget is described in full in the "Showing the Calendars" section. This widget can be used for displaying a list of event categories. Event category name will be linked to the archive for that category, so when clicked, only events filed in that category will be displayed. This widget can be used to provide some filtering controls for the event archives. Becuase the filtering controls provided by this widget only work on the event post type archive and the event category archives, you should not use this widget to try and filter a calendar display. Order: ASC - DESC - this will change the order that events are displayed, nearest to farthest and farthest to nearest. This widget can be used for showing a plain-text list of events. 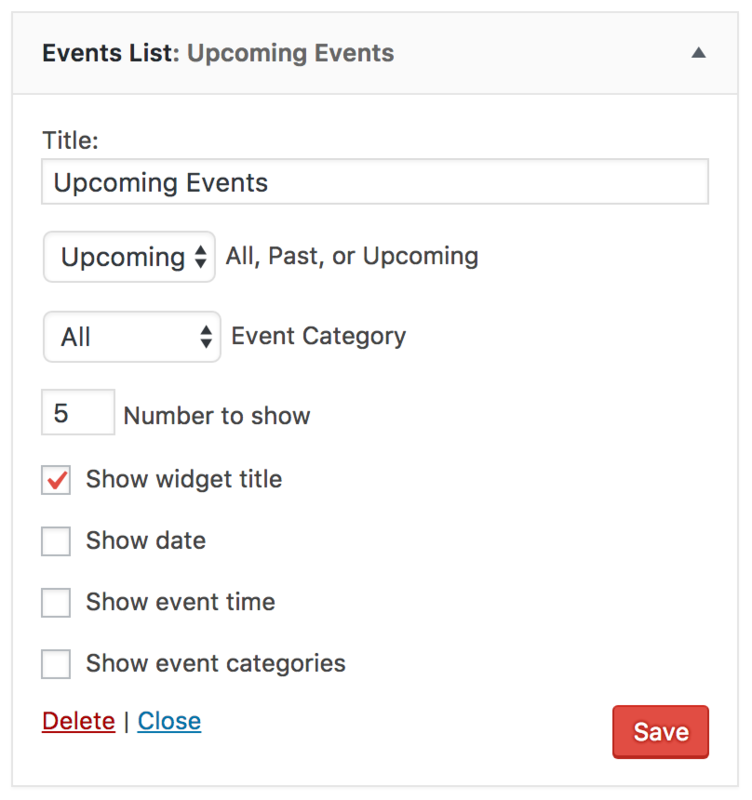 With the widget options, you can choose whether to show only upcoming or past events (or all), the event category to show, and how many events you want to show. When showing Upcoming Events, events will be shown with the nearest at the top (the ones closest to happening). When showing Past Events, events will be shown with the most recently past at the top.